Understanding how individuals and populations respond to environmental change is currently the most pressing issue facing ecologists and conservationists. 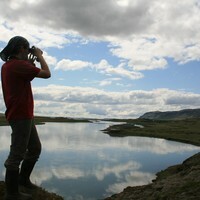 Migratory shorebirds, particularly arctic breeding waders, are restricted to a unique set of habitats which are amongst those currently facing the highest levels of climatic change. Several of my study species have breeding populations in arctic and sub-arctic regions where global warming is most evident and spend the nonbreeding season in temperate and tropical coastal areas, both in estuarine wetlands and open shores where anthropogenic activities (e.g. land use change, pollution, disturbance), sea level rise and erratic climate patterns are increasingly apparent. Investigating individual level responses to environmental changes and associated fitness outcomes allows predictions of the impacts on species demography and distribution, and consequently aids the development of measures for the management and conservation of ecosystems and biodiversity at very large scales. The phenomenon of migration involves the seasonal movement of vast quantities of biomass across the planet. The annual displacement of birds between Europe and Africa alone (the Afro-Palaearctic migration system) is estimated to involve 2.1 billion individuals. Migratory birds produce the most amazing connectivity of all migratory systems bridging several biomes, most notably linking the arctic with the antarctic, and in some cases, doing so very quickly in extremely long distance flights. Species often breed in the northern hemisphere where short-term nutrient bonanzas allow rapid rearing of young during summer but, during the northern winter, they move to southern latitudes where mortality is the most relevant demographic parameter. Such annual cycles can promote the flow of nutrients across vast geographical areas, but other items, e.g. plant material, ectoparasites and endoparasites can all be displaced by migrants, some with potential impacts for the human population (e.g. H5N1). The study of migratory movements over vast geographical scales requires the ability to continually track large numbers of migrants. Using innovative tracking technologies (e.g. ultra-light tracking devices, GPS/GSM tags) and analytics tools (e.g. weather radars to track migration) allows us to unravel migratory routes, seasonal and temporal use of distinct sites, and the level of connectivity between locations. This information, combined with species and individual level demographic parameters can be used to address the function of migrants in the flow of nutrients and organisms across the globe. wetlands which can therefore serve as an ideal laboratory in which to study these processes. José Alves from Departamento Biologia - UAveiro on Vimeo.